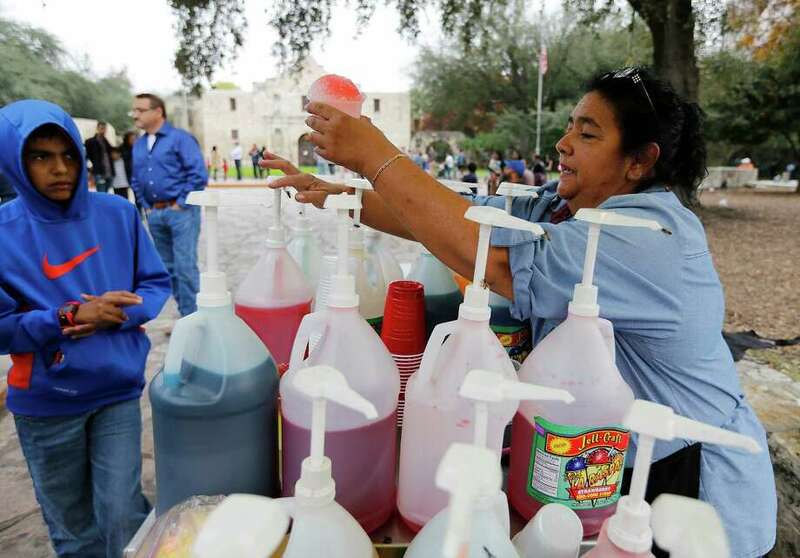 Snow cone vendor Maria Prieto serves a customer in Alamo Plaza. With Christmas Day temperatures in the mid-70s, about 10 degrees higher than typical for Dec. 25, business was brisk. San Antonio wasn’t exactly a winter wonderland on Christmas Day, with temperatures hitting the mid-70s, about 10 degrees higher than typical for Dec. 25. Maria Prieto took advantage of the cloudy but warm weather by bringing her raspa cart to Alamo Plaza, which was teeming with tourists in the afternoon. She usually works the area during the summer. “I’ve been doing snow cones for almost 20 years, and I never remember being here during Christmas,” Prieto said before serving up coconut-flavored shaved ice to a customer in short sleeves. Business also was brisk at the San Antonio Zoo, where attendance had reached about 3,500 by 3:30 p.m. Friday. Temperatures were in the 70s and 80s for several days leading up to the holiday, but the weather was expected to turn severe late today, with a cold front ushering in storms. Wednesday’s high of 83 degrees tied the record high for Dec. 23 in 1972, and today’s high is expected to be around 80 degrees, said Larry Hopper, a meteorologist with the National Weather Service. The record high for Dec. 26 was 83 degrees, set in 2008. “The bigger story is the fact that we’re going to have showers and thunderstorms Saturday, with the best chances really late Saturday night into early Sunday morning along the cold front and possibly out in front of the cold front,” Hopper said. The high for Sunday is predicted to be in the mid- to high-50s. Highs will be in the 50s next week, below normal for this time of year, when average temperatures are in the lower 60s, Hopper said. The low temperatures generally will be in the 30s, slightly below normal. “Winter is coming back,” he said, although snow is not expected in the Hill Country. Warm as it was on Christmas Day, it didn’t come close to the record high. That was in 1955, when the thermometer hit 90 degrees. The record low was in 1983, when the thermometer plunged to 11 degrees on Christmas Day.